We prioritize the safety and well-being of all members of our community. 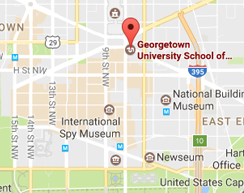 Working closely with the Georgetown University Police Department (GUPD) and the D.C. Metropolitan Police Department (MPD), our building landlord's security team, and our own campus security team, we strive to ensure a safe learning, teaching, and working environment at 640 Massachusetts Ave NW. All of the security systems at SCS are monitored 24 hours a day by our building’s security teams. Security systems at our campus include: electronic building access control, surveillance cameras, panic alarms, internal classroom phone systems, fire control systems, and a campus loudspeaker system. Security escorts are available for students, faculty, and staff, Monday through Friday from 7:30 p.m. to 11:30 p.m., and can accompany you to the neighborhood Metro stations and parking garages/lots. To request assistance, speak with an officer at the SCS Security Desk on Level 1 or call (202) 784-7375. HOYAlert: To receive important emergency information via text message, voicemail, and/or non-Georgetown email, select “School of Continuing Studies (SCS)" as your primary campus and select "640 Massachusetts Avenue NW” as your primary location. Alert DC: To receive important emergency information via text message, email, and/or phone for the area around 640 Massachusetts Avenue NW, select the following communities/neighborhoods: Chinatown, Mount Vernon Square, and Penn Quarter. Daily Crime Log: The daily crime log at SCS is maintained at the entrance of the building on 640 Massachusetts Avenue NW. Documented incidents within the last sixty days are available for public viewing upon request. Please visit the GUPD website for information on reporting a crime. Evacuation maps with suggested routes are posted in all classrooms and conference rooms, at all emergency exits, and in all staff office areas within the building. There are two emergency stairwells available to use during an evacuation. Please take a moment to familiarize yourself with the locations of these stairwells to help you prepare in the event of an emergency. It is NOT recommended you use the atrium staircase during an evacuation, as exits may be blocked when the building’s fire curtain is lowered in the event of a fire. DO NOT use the elevator during an evacuation. SCS student and faculty members with disabilities are identified by program staff and given a card with emergency evacuation information. If you have a disability and have not received this card, please visit the reception desk in the main lobby on Level 1 or call (202) 687-7723. In the event of an evacuation, persons with physical disabilities that prevent them from exiting the building with others should proceed to the nearest stairwell and wait there to be evacuated by a member of SCS’s Building Marshal Team or the D.C. Fire & EMS Department. If possible, persons with physical disabilities should ask another person to accompany them to the stairwell, and then that individual should immediately inform a building marshal, security officer, and/or other emergency responder of their exact location (i.e. floor, stairwell number, etc.) once he or she has evacuated. SCS will always follow the University’s operating status determinations on campus closings, class cancellations and late openings due to inclement weather, giving primary consideration to the safety of students, faculty, staff, and visitors. Determinations will be communicated via HOYAlert, email, phone, and the University’s website. SCS may make its own additional determinations on closure under special circumstances unique to our location. Criteria that may be considered in making such determinations include: condition of area roads and ability of faculty, staff, students, and visitors to get to campus; status and schedules of public transportation; and upcoming weather forecasts.